Half Film Reissues Out Now on CD and Digital! 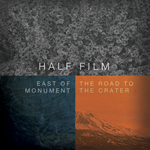 Hidden Shoal Recordings is proud to announce CD and digital availability for the reissue of two late 90’s slowcore masterpieces East of Monument and The Road to the Crater by San Franciscan trio Half Film. Both albums are available together as a specially priced double CD and singley in digital formats. All CD orders come with an immediate download of both albums. Before releasing music on Hidden Shoal as [The] Caseworker, Conor and Eimer Devlin, along with drummer Jason Lakis, made up slowcore trio Half Film. Their two acclaimed albums – East of Monument and The Road to the Crater – are now lovingly reissued by Hidden Shoal. With a sound mapped out so definitively, it’s difficult not to immerse yourself completely in this music’s shadowy topography. Right from East of Monument’s languid opener ‘Weather Patterns’, it’s clear there’s a deliberate, measured and deeply rewarding melodic map unfolding, akin to classic releases by Codeine and Low. This aesthetic is explored, refined and distilled across the two records, and by the time The Road to the Crater’s finale ‘Themselves’ has played out, the special pocket of indie-rock that Half Film inhabited completely in the late ’90s has been revealed anew. Head to the Hidden Shoal Store to grab your copy now and stream both albums in full. To get you in the mood the track ‘Machines, Hawks And The Perfect Equation’ is also available fro free download.